We provide quality stairlifts at competitive prices because our goal is to make life easier for you. How can you tell? We are a family business. We put our name on everything we make as a quality guarantee, because we are 100% sure it will meet your high expectations. How do we make sure we give you the best service possible? Because we control the whole manufacturing process, we can be sure that only the safest materials and best practices are used. Your stairlift needs to be reliable. That’s why it’s battery powered, so that if you have a power outage, you won’t get stuck on your stairs. We are manufacturers. That means we can test each stairlift rigorously to make sure that it meets the highest standards of quality, comfort and safety. From start to finish, we design and make a stairlift that is the perfect fit for you and your stairs. That means it can be customised to meet your personal needs. We’ve been in business for 150 years, so you can trust that we know what we’re doing. Our trusted dealer provides a free home survey to help you choose the best stairlift for you. You don’t even have to leave the comfort of your own home. During your home survey, you get a written, fixed quote that is clear and easy to understand. 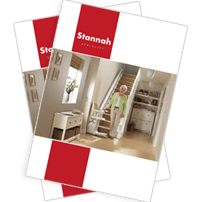 With a Stannah stairlift, you can stay in your own home for longer. We are here to help you get the most out of your house, by providing you with the technology you need to be as comfortable as you can be. This means that you can stay in your house for that much longer, remaining in your community, in familiar surroundings, in comfort and safety. We are innovators. We’re always looking for new ways to improve our products to make your life more comfortable. We make sure our trusted dealer has engineers all over the country, so no matter where you are, know that they can get to you quickly. On the day of installation, Stannah certified technicians won’t leave your house until you feel completely comfortable using your new stairlift. In the unlikely event that something happens to your stairlift, our trusted dealer’s call-out service means that a near-by engineer is available to you, whenever you need them. We’re always improving and pushing ourselves to build the best stairlift out there. Because we can only provide the best service if we excel in every area.